Make your feedback have the impact it deserves by the manner and approach you use to provide performance feedback. Your feedback can make a difference to people if you can avoid provoking a defensive response. These guidelines will help you help employees develop their performance. Effective employee feedback is specific, not general. For example, say, "The report that you turned in yesterday was well-written, understandable, and made your points about the budget very effectively." Don't say, "good report." One of the purposes of effective, constructive feedback is to let the individual know the specific behavior that you'd like to see more of from him. General feedback like a pat on the back makes the employee feel good momentarily but doesn't do a good job of reinforcing the behavior. The best feedback is sincerely and honestly provided to help. Trust me, people will know if they are receiving it for any other reason. Most people have internal radar that can easily detect insincerity. Keep this in mind when you offer feedback. Successful feedback describes actions or behavior that the individual can do something about. If you can, provide any tools, training, time, or support that the person needs to successfully perform as you need her to perform. Whenever possible, feedback that is requested is more powerful. Ask permission to provide feedback. Say, "I'd like to give you some feedback about the presentation, is that okay with you?" This gives the recipient some control over the situation which is desirable. When you share information and specific observations, you are providing feedback that an employee might use. It does not include advice unless you have permission or advice was requested. Ask the employee what he or she might do differently as a result of hearing the feedback. You are more likely to help the employee change his approach than if you tell the employee what to do or how to change. Whether the feedback is positive or constructive, provide the information as closely tied to the event as possible. Effective feedback is well timed so that the employee can easily connect the feedback with his actions. Effective feedback involves what or how something was done, not why. Asking why is asking people about their motivation and that provokes defensiveness. Ask, What happened? How did that happen? How can you prevent that outcome in the future? How can I have done a better job of helping you? What do you need from me in the future? Check to make sure the other person understood what you communicated by using a feedback loop, such as asking a question or observing changed behavior. Set a time to get back together to discuss whether the feedback changed performance and whether any additional actions are needed. Successful feedback is as consistent as possible. If the actions are great today, they're great tomorrow. If the policy violation merits disciplinary action, it should always merit disciplinary action. 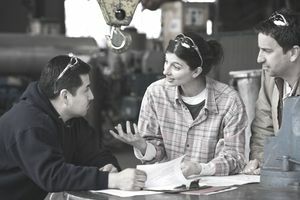 Feedback is communicated to a person or a team of people regarding the effect their behavior is having on another person, the organization, the customer, or the team. Positive feedback involves telling someone about good performance. Make this feedback timely, specific, and frequent. Constructive feedback alerts an individual to an area in which his performance could improve. Constructive feedback is not criticism. It is descriptive and should always be directed to the action, not the person. The main purpose of constructive feedback is to help people understand where they stand in relation to expected and/or productive job behavior. Want to Know the Secret to Successful Business Networking?